Over the last year we've been excited to hear owls close to our house in the woods behind us. So with the days now shorter it seemed like the perfect time to start learning about our owl neighbors. We've been reading several books, both fiction and nonfiction, as well as talking about owls and their sounds. 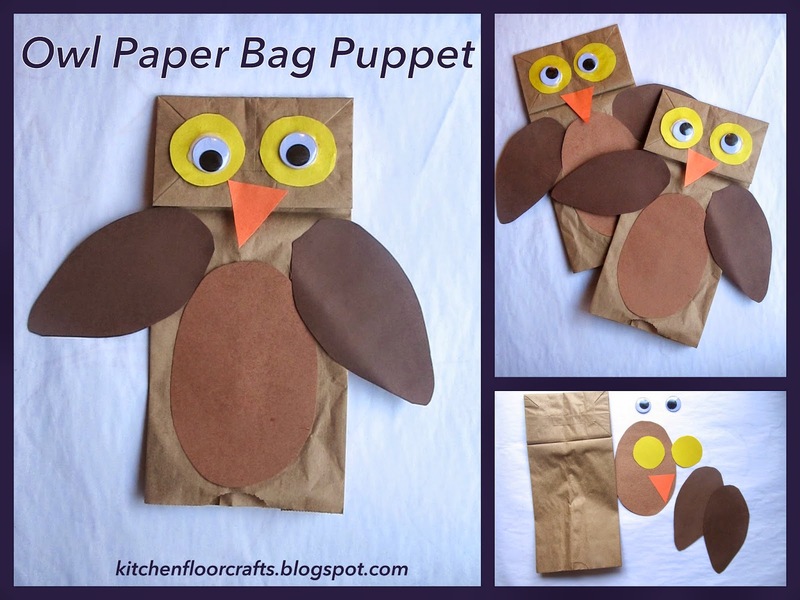 Our first owl craft was a quick and easy one, Owl Paper Bag Puppets. We've made paper bag puppets before when we created our "Puff Dragon" paper bag puppets. It's such a fun and fast way to create a puppet, and can be made as a variety of animals. 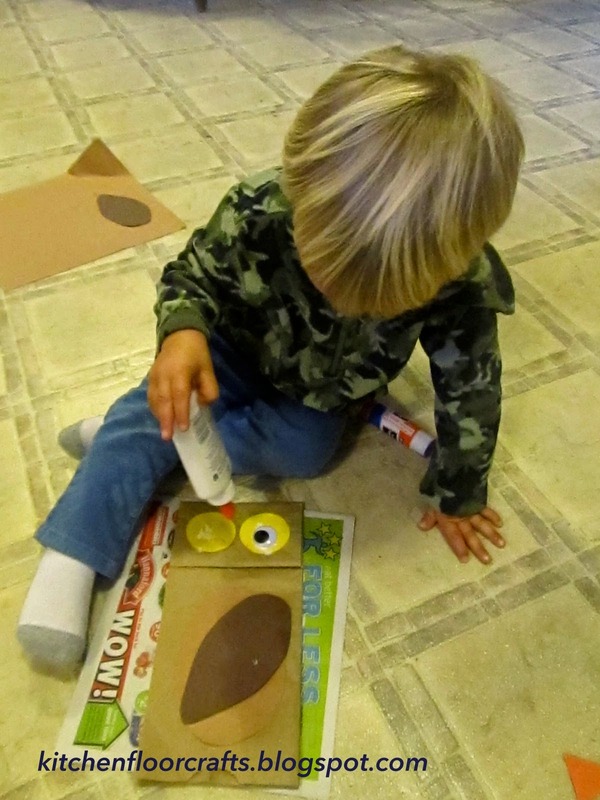 To begin with I cut shapes from brown, yellow, and orange construction paper. The shapes included circles for eyes, a triangle for a beak, an oval for a belly, and half ovals for wings. 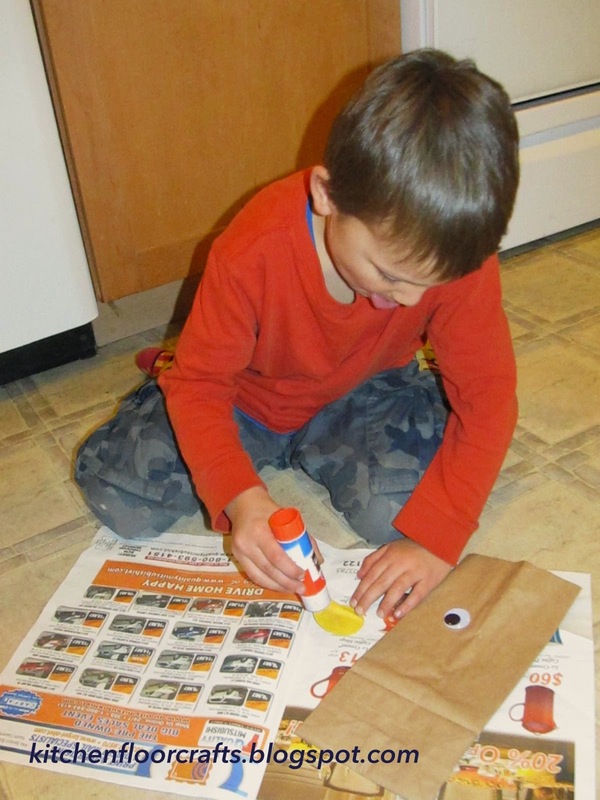 We also used large googly eyes and of course a small, lunch sized paper bag. We used both glue sticks and white glue to attach the different items. Big Brother used the glue stick to attach all the construction paper pieces to the bag. I also used glues sticks on the backsides of Little Brother's pieces and helped him attach the pieces to his bag. Afterwards we used white glue to attach the googly eyes on top of the yellow circles. Little Brother had fun trying to squeeze out the glue on to his eyes, but really it took me helping to get any glue out. We let the puppets dry for a little while and then boys pretended to fly them around the house. Of course there was lots of "whooing" too! We're looking forward to some other fun owl learning crafts and projects!